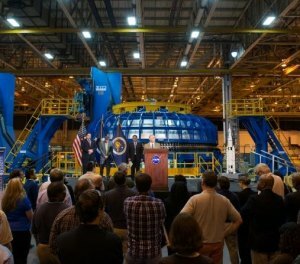 With the Space Launch System in the background, NASA Administrator Charles Bolden spoke Jan. 13 during a visit to the agency’s Michoud Assembly Facility in New Orleans. Image: NASA. With commercial companies now restocking the International Space Station, NASA is turning its attention to its next challenge -- deep space. NASA Administrator Charles Bolden on Jan. 13 visited the agency’s Michoud Assembly Facility in New Orleans to see the progress on the Space Launch System (SLS), the most powerful rocket ever built -- a rocket that will take American astronauts into deep space, first to an asteroid beyond the moon and eventually on to Mars. Bolden, joined by Sen. David Vitter of Louisiana, toured construction of Michoud's advanced welding facility. There, 27.5-foot diameter cylinders, domes, rings and other elements will be brought together to form the fuel tanks and core stage of the SLS, which is targeted for its first flight test in 2017. When completed in March, the Vertical Assembly Center will be home to one of the largest welding tools of its kind. Three of four major robotic welding tools already are installed at Michoud, where SLS's core stage prime contractor, the Boeing Co. of Chicago, is leading a team producing test articles for the rocket. Bolden also took time during his tour to place a call to the International Space Station mission control at NASA's Johnson Space Center. He congratulated the flight team there, the space station crew and the Orbital Sciences Corp. team in Dulles, Va., on the successful docking of Orbital's Cygnus cargo spacecraft at the station on Jan. 12. "The United States no longer has to rely on others to get cargo and science experiments to the International Space Station," said Bolden following the call. "Thanks to the bold commercial space plan we’ve been pursuing, we now have two American companies to resupply [the] station, launching once again from U.S. soil. My hat’s off to the Orbital and NASA teams who worked so hard over the weekend to successfully capture and berth the Cygnus spacecraft to the ISS." For more than 50 years, Michoud has built large-scale space systems for NASA, including stages of the Saturn V moon rockets and external tanks for the space shuttles. Michoud has more than 43 acres of advanced manufacturing space under one roof. "The Space Launch System is becoming a reality thanks to the unique workforce and tools at Michoud and NASA facilities across the country," said SLS Program Manager Todd May, who joined Bolden on the tour. "We're on schedule and looking forward to SLS's first launch."